Dusk Till Dawn is the first illustrated book to tell the history of the evening dress, showing how styles we wear today have been influenced by many centuries of dressing up for the evening. The book focuses particularly on the last 100 years, with images of the fashion world's most luxurious creations, and text explaining the cultural and artistic influences at work. The evening dress is unlike any other article of clothing a woman will ever own. For centuries it has wielded the ability to transform the wearer into an object of beauty poised for seduction. In the twenty-first century, with casual dress increasingly the norm, the evening dress remains an enigma. 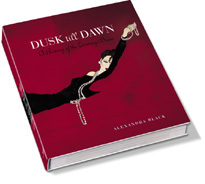 Dusk Till Dawn charts the fascinating history of this special garment, illustrated with archival photographs, original illustrations and beautiful fashion images. From the magnificent gowns worn by Venetian courtesans, to spangling flapper dresses hand-stitched with hundreds of beads, to backless satin sheaths designed to reflect the light, to fairytale layers of froth and tulle, every imaginable style is covered. Famous designers, priceless materials, muses and celebrities, love affairs, parties, banquets, balls and decadent nights - all are summoned up to tell the story of the evening dress.